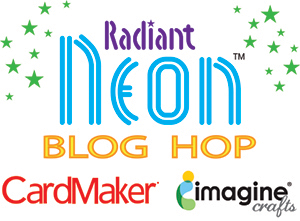 Welcome to the Imagine Crafts/CardMaker blog hop. You should have arrived here from Taylor's wonderful blog. 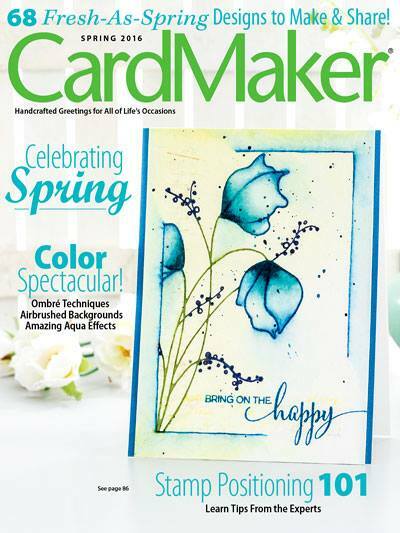 If you find a broken link or need to go back to the beginning, you can always go to the CardMaker Blog to start over. Today we are focusing on Neon colors, which is the new trend for fashion as well as a paper crafting for 2014. 1. Start with a card base of white card stock measuring 5.5. x 4.25 when folded. Ink edges with all of the Radiant Neon colors. Set aside. 2. Cut white card stock just a bit smaller than base. Die cut openings as shown using Tiny Tags die. Stamp and heat emboss sentiment. 3. 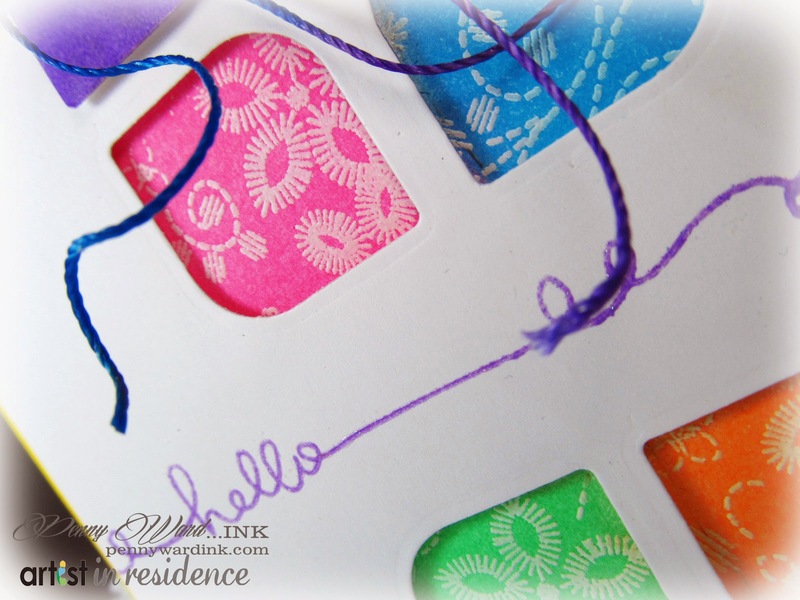 Take a large scrap of white card stock, stamp and heat emboss tiny flowers. Ink around the flowers with four of the Radiant Neon inks. Adhere to back of die cut panel with foam adhesive so the pretty neons show through the openings. Adhere this panel to card base. 4. 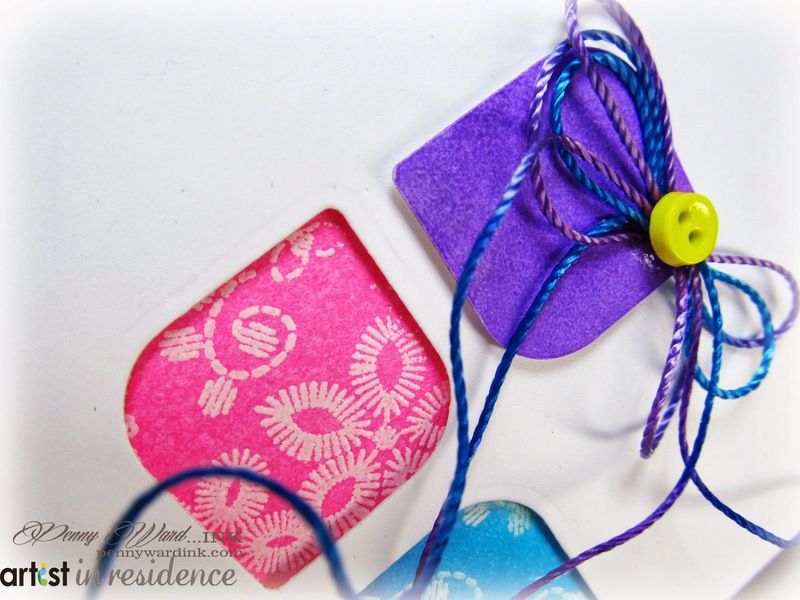 Die cut and ink a tag using Radiant Neon Purple. Adhere to card front with foam adhesive. Tie floss into a double bow, attach and add a neon button. Have you been collecting the "Electric Words" along the hop? Ok...on to your next stop..... Kristine has something special planned and another Electric Word for you. Wow! Love the small windows showing the different inks used. Penny I think that I'll be breaking out this die set this weekend and be lifting this idea from you! Love all the color on this fun card. Fabulous, awesome card. Love the way you highlighted the colors with die cut outs. Operation Write Home is awesome, I make cards too, but much more simple. Fabulous color blocking Penny! Very inspiring! Love the cut outs! Really showcases the neon colors! The cut-out windows are a great idea to let the color peek through! Thanks for being a part of the hop! Love your window peaks of colour! Love your pretty card! The colors are just amazing! FUN FUN FUN! Love your multitude of colorful use of the Radiant Neons!! 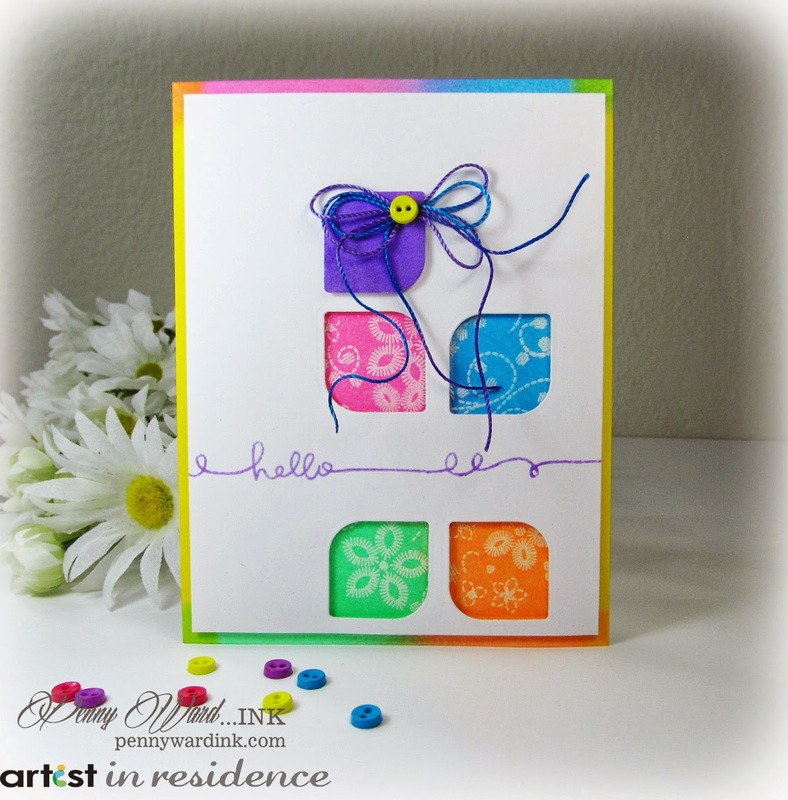 Your card is so fun and I will vividly remember it as one of my favorites on this hop! TFS! Lovely card. Love the background, love the idea, love everything about it. Oh my goodness - I love this!!! Beautifully done! I'm also your newest folloer - love your blog! These neon inks are AWESOME! Pretty card! Love the cut out! Penny, I really love how the 'inlaid' pops of Radiant Neon colors show off their beautiful colors, and the border inking. Such a fun card - love the border! excellent way to show off the fresh colors! I'm late to the party but I just wanted to tell you how much I enjoyed your card, the openings are marvelous. BEAUTIFUL! How cute and clever !!!! Lov it!!! !